Last week, I preached the first sermon for the year, presenting a question to the congregation: "What kind of New Year resolutions should we make?" My intent is to encourage people to start the year well, with the Word of God as our guiding lamp and light. That we will be enlightened and illuminated by God's Word in our hearts, that we may shine forth for God in our good works. Many things in the Bible can only be learned by obedience, not mere study/analysis. Some people are sick of making resolutions, as they feel like they have never been able to keep it anyway. Others are nonchalant about it all, preferring to keep to the status quo. For them, no change is a good thing. Whatever it is, every New Year begins with some kind of a new hope and promise that things will be different this year. Will it not? That depends. It depends on our attitude toward life. It depends on our determination to try again. For Christians, it is not simply about making or not making resolutions. It is about making good resolutions, especially the ones that gear toward becoming more Christlike and making disciples of all nations, starting with ourselves. It is with this that I challenged the congregation to adopt one or more of the five resolutions which I call GOOD resolutions. Here is a summary of the five. In our high-achiever society, independence is a much sought after status. Children in particular can breathe a sigh of relief as they do not need to be dependent on their parents anymore when they reach the legal age for adulthood. Independence means freedom from parental restrictions or curfews. Independence is cool. Independence is liberation from rules and regulations. Yet, spiritually, we cannot survive on our own. The problem with mankind is that they become too independent for their own good. They easily become selfish with their own ways. They become self-seeking creatures to the detriment of the community. Perhaps, we need to learn to grow more on dependence on God rather than the world. This is because spiritually we are lost without God. Blessed are those who are aware of their own self-limitations and adopt a state of humility and depend more and more on God each day. Resolution: I resolve to increasingly lean on God for all of my decision making. It can be through prayer, or through humility, I will refrain from self-seeking independence and progress toward God-dependent lifestyle. 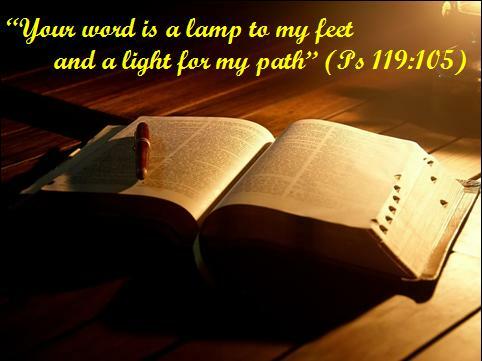 The Scriptures urge us to depend on God, for God's Word is a lamp to our feet and a light to our path. When we encounter darkness, sometimes our natural reaction is to simply shrink back and wait until sunlight appears before venturing out. When we hear screams in the dark, we will huddle back in fear, unwilling to venture into the unknown, even when we hear a victim's scream a far distance away. God's Word is a lamp and light that we have. In a world of darkness, God's Word can shine forth to help us see and to walk in the ways of the Lord. When we are spiritually sleepy, we miss out on the will of God for our lives. In Jared C. Wilson's "Gospel Wakefulness," one key reason why many Christians are spiritual sleepyheads is because the centrality of the gospel makes no sense to them. Often, the root of the problem lies in not knowing God's Word in the first place. That is why we need to keep God's Word in our hearts. One way to do so is to embark on a Bible reading schedule that is regular, consistent, and disciplined. Resolution: I resolve to read through big chunks of Scripture through the Year. I recommend reading through the New Testament and Isaiah. The plan is available here. Many of us are in positions of influence in our respective domains. Whether in the home, at work, or in our social circles, we all have a role to play. Timidity is often a problem with the attitude of our heart. It claims inability and questions why one needs to volunteer. It prefers to let others do it. It prefers to procrastinate. Courage on the other hand requires us to live up to our own highest ideals. We are to lead with a positive attitude for God, rather than to shirk aside our responsibilities. Courage proclaims that with God's help, we can do it. It volunteers without being asked. It is open to God's prompting and call to do good works. It acknowledges that today may very well be the tomorrow we have been talking about yesterday. Perhaps, this year is the "next year" we have been talking about in the past few years! Resolution: If not you now, then who? If not now, then when? It is so easy for us to toe the line, and to mind our own business even in the light of evil happening before our very eyes. Poverty levels remain high. Homelessness continues to be a problem. The gospel is still not preached to certain other places. What is our response to all of them? Do we simply complain to God that we have no resources or time to do that? Surely, if we make an effort to look for an opportunity to give and to serve, God will provide. Perhaps, the reason for our inaction is because we too have the lame excuse of the lame man of Bethesda. God is telling us: "Get up! Pick up your mat and walk!" Resolution: Faith is responding to the prompting of the Holy Spirit in our hearts. Wake up! Pick up your courage and do something! For many Christians in many Churches, comfort is something we all enjoy having. So much so that once we are snuggled up in a nice corner in our favourite places, we become coccooned in. We wrap ourselves up with nice clothes and comfortable friends, that the world we live in becomes comfortable and hems us in. As a result, we are willing to live a lethargic Christian life as long as we maintain our levels of comfort. Wrong! If we are serious about the gospel, we must not let comfort be our top priority. In fact, the early disciples of Christ could have comfortably remained in Jerusalem. Paul could have remained an influential solicitor in Rome. Yet, they press from Jerusalem toward Judea, Samaria, and many other parts of the world. Paul himself makes at least three missionary journeys. The key is this. If we want to have spiritual vitality, we need to leave our comfort zone. Resolution: I resolve to leave my comfort zone through risk taking and gospel sharing. May a great year ahead, with making and keeping good resolutions, that Christ be glorified as we walk in the light of God's ways, and live in the power of God's Word. THOUGHT: For far too many things in the Bible can only be learned by obedience. In fact, obedience brings understanding in ways no analysis can ever achieve.